Talking belly-buttons? A classic. Best party-game ever. I just want to say that I love the motorcycle picture on the wall. Very retro-chic, mechanic's pin-up style. a. Muffintop drumming, with vocal accompanyment. f. Riddle competition, picture is the revelation of the answer to your, "What's white with a button in the middle?" h. Singing lessons, this is you explaining how to "sing from your diaphragm"
k. You: "Who wants to see just how much lint is really in there?" ND I'm trying to figure out who you are because that was super funny and I am totally LOLing. 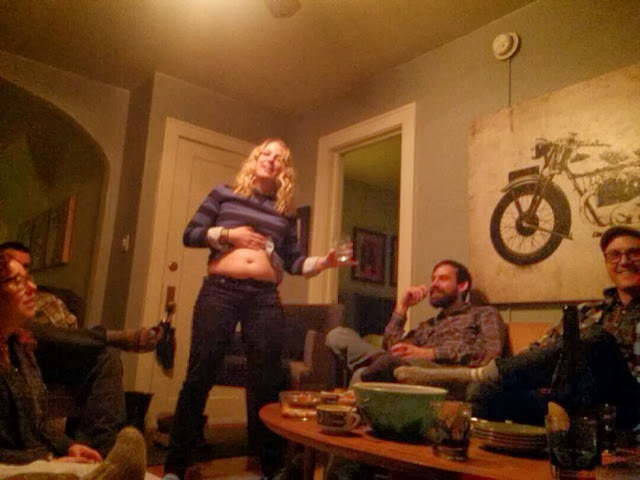 l. At a certain point during every single party -- or office meeting -- I have ever been to in my life, (maybe there's a lull in the conversation) I expose my belly and force people to look at it. The end.